Cover art by Daniel Ljunggren. 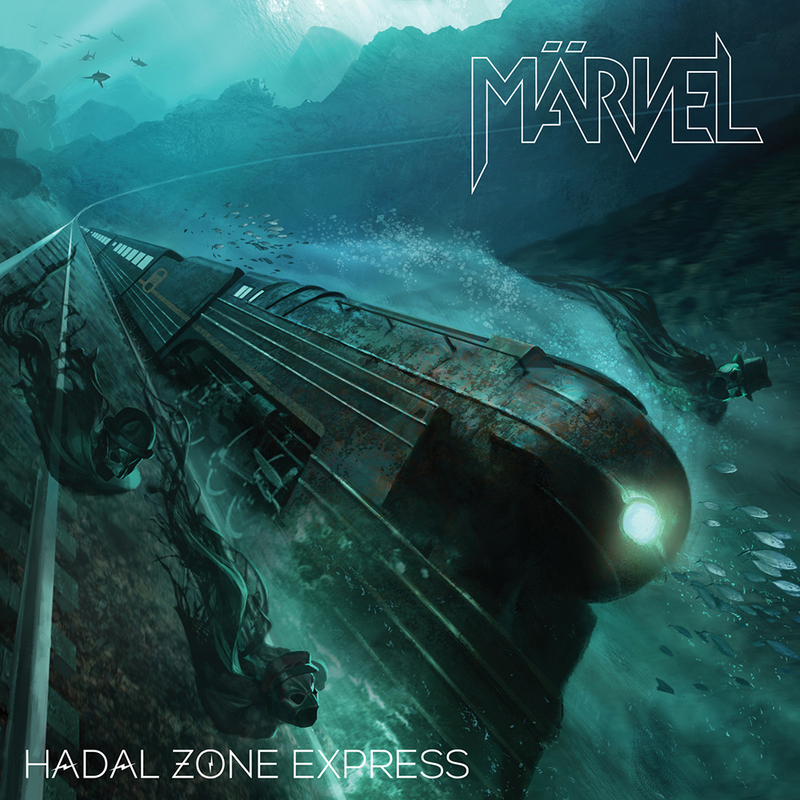 The title Hadal Zone Express has been described by guitarist and singer, The King, as his own version of Highway To Hell. It's a fast paced roller-coaster down into the darkest realms of Hades. Into the Underworld. It'́s not cozy and warm, nor shiny and bright. It's dark and blue, filled with melancholy and bittersweet stories. It's a hard place, but one which you will instantaneously love. So buckle up, we're going down. Deep down. Fast. On Märvel's fourth album, the band decided to try and re-invent themselves, to explore the deeper realms of their songwriting capabilities, and to craft 11 new songs to perfection. A rock 'n' roll perfection that is. With years of touring around Europe honing their skills, three albums under their belt, and close to ten years in existence, it felt right to try and twist the knobs one extra turn. Add to that all the new and raw energy from bass player The Burgher, who has been with the band for three years but not yet recorded an album, and it's only natural to get a bit excited. Dark and all, this album is in many aspects the most shimmering and tight one yet from the trio. The approach going in to the studio, was to capture the three instruments as true as possible, and not to add unnecessary instrumental overdubs. This also meant re-hashing riffs and rhythm patterns until each instrument popped exactly as wanted. What you'll hear is indeed a power trio. At the same time, the band worked hard on vocal harmony arrangements, to add a wideness and that perfect, big, sound. While doing this, the band has managed to squeeze in everything you like from the rock history into their very own, now classic, high energy Märvel sound. As always, you will hear influences from mid 70's glam and shock rock, 60's soul and 80's heavy metal, but this time around, there are also also echoes from late 70's and early 80's power pop and west coast yacht rock. As with their last album, Hadal Zone Express is recorded in White Light Studios, by Joakim Kärling, and produced by the band together with Kärling. Märvel is The King, The Vicar and The Burger.